On Thursday, the General Debate continues as heads of state and government address their peers. The debate will be webcast live starting at 9 a.m. NYC time. 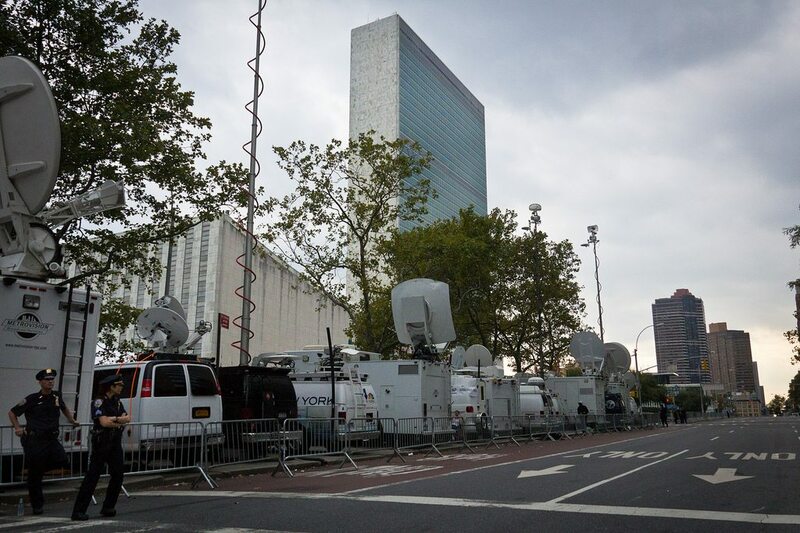 See who’s expected to speak in the lists of speakers in the UN Daily Journal. At 9 a.m., The Missions of the UK and Saudi Arabia will host a “Friends of Yemen” meeting. You can follow #Yemen for updates. At 10 a.m., the Mission of Nigeria will host a meeting on its experience of accelerating progress towards meeting the Millennium Development Goals. With armed conflicts trending upward again and proving increasingly complex, the challenges are also mounting for mediators working to resolve them through negotiations, the United Nations will launch its Guidance for Effective Mediation at 11 a.m. The first broad UN guidance of this kind reflects the experience of mediators over more than six decades and was developed in close cooperation with the UN’s partners including member states, regional/subregional organizations and other relevant actors. The Mission of Canada, the Gates Foundation and the Secretary-General will host a meeting on the legacy of polio at 12:30 p.m. The campaign to eradicate polio is close to reaching its goal, but needs one final push. You can follow the campaign and Thursday’s meeting at #endpolio. (watch live). See why Bill Gates is calling this event “the hottest ticket in town” in this post. UN Women will host a meeting at 1 p.m. on boosting the economic empowerment of rural women. Join the conversation by using the tag #RuralWomen. Thirty countries – home to 56 million chronically malnourished children – are now committed to unlocking the potential of their entire populations by ensuring a good nutritional start to life during the 1,000 day window of opportunity between pregnancy and a child’s second birthday. At 3 p.m., the UN Secretary-General will join others for an update on the Scaling Up Nutrition movement. You can join the conversation via twitter at #scalingupnutrition and follow and @SUN_Movement for updates. Meanwhile, the UN Deputy Secretary-General, Jan Eliasson, will speak at a meeting on Water and Food Security held by the Mission of Qatar. The situations in Sudan and South Sudan will be discussed at a high level meeting at 4 p.m. In the evening, Princess Mary of Denmark will be among those speaking at the launch of Why Poverty, a cross-media event that aims to reach 500 million people. Follow their updates live @askwhypoverty.